The 8A-UBEC is a switch-mode DC-DC regulator supplied with a 2-3 cells lithium battery pack and it outputs a consistent safe voltage for your receiver, gyro and servos. 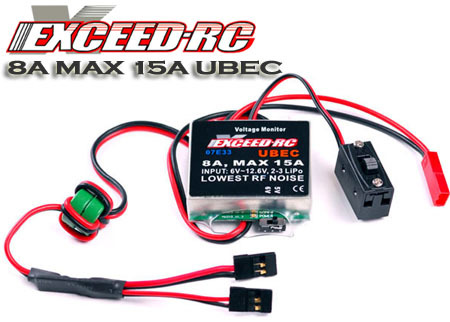 It is very suitable for nitro powered RC helicopter (bigger than 30 class) and big fixed-wing aircraft. Compared with the linear mode UBEC, the overall efficiency of the switch-mode BEC is much higher, so it can extend the working time of the receiver battery pack, and because a switch mode UBEC can significantly reduce the heat emission, it can avoid the loss of control caused by the over-heat problem which is frequently happened with the linear mode UBEC. 2.1 Designed with an advanced switch mode DC-DC regulator IC. 2.2 The output current is very large. 2.3 With the output short-circuit protection function. 2.4 A metal shield covers almost all the electronic components, and a filter ring is attached with the output wires to significantly reduce the electromagnetic interference. 2.5 Automatically detects the number of the lithium battery pack (2 cells or 3 cells). 2.6 Shows the battery capacity with 4 indicators (LEDs). 2.7 Shows the working status with an indicator (LED), lights when the output is in normal range. 2.8 There are 2 output leads to reduce the resistance when connecting the UEBC to the receiver.